In this competition, any two languages that share the same language genealogy will not be a second language to each other, such as, Spanish will not be a second language to a person with English being his or her first language while Arabic, Chinese or Japanese would be his or her second language. At here, the second language must be a major world language: Indo-European languages (English, Spanish, French, etc),	Arabic, Chinese language system (Chinese, Japanese, etc), and it can not be a primitive aboriginal language that is used in a primitive social order. and the verbal (speaking) language is not a part of this competition. her selected second language at the point of entering into this competition. The standard for success and completion of this competition is that the attempter must be able to read a current newspaper published in the selected second language at the proficiency equivalent to the native people of that language. The way to test this proficiency is described in	II.B. Testimony from friends, former co-workers and family to prove that the attempter knew not a single written word of the selected qualified second language at the initial condition. Fifty (50) words from a current newspaper of the selected language will be randomly selected. Each word will be presented for ten seconds and the attempter will duplicate each word by hand writing and will provide its meaning. Note: This is not a timed section. However, one hundred twenty (120) minutes could be a reasonable estimate. Three (3) headlines will be randomly selected and the attempter will translate each headline into his or her native language. Note: This is a language proficiency test and not a culture knowledge test. Therefore, any cultural-laden phrase shall be excluded from this proficiency test. This is not a timed section. However, forty five (45) minutes could be a reasonable estimate. Test on the proficiency of using a dictionary:Knowing how to use a dictionary is a very important part for literacy. In this section, twenty (20) minutes is allowed for the attempter to use a dictionary to check his or her previous test sections. Note: The dictionary used by the attempter shall be examined and approved by the testing and verification committee. Each word of the fifty (50) word section accounts for 2 points, and the total section accounts for one hundred (100) points. In this section, each question has a two part answer, duplication of a word by hand writing and the meaning of that word. An error in either part of each answer will result in a 0.80 point deduction. Each answer for the headline translation section accounts for 5 points. This section of the test accounts for fifteen (15) points. For the dictionary section, no point is given directly. Any point gain through	corrections of the two above test sections by using a dictionary will be the score of this section. A test score of eighty (80) or greater (from the sum of all three sections) will be success and completion for this test. The operations of this testing and verification committee must be fully transparent, such as under the review of public media. The testing and verification committee must issue two certificates. The above two certificates must be placed in the public eye for review for thirty days. If there is no challenge made, then the first confirmation certificate can be issued. The methodology used by the atemptee must be placed in the public eye for examination for thirty days. If there is no challenge made, then the second confirmation certificate can be issued. Ten days after two confirmation certificates are issued, the certificate of the World Record can be issued to the attempter. 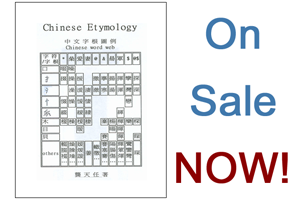 Sign up to get a FREE introductory demo presentation on Chinese Etymology, be informed on upcoming events, receive our courtesy newsletters and get special offers! We do not sell, trade, or transfer to outside parties your email address and personally identifiable information.